Jojuana Phillips was born and raised in Alexandria, Louisiana. Despite living further down south in the state for a short period, Alexandria always has been and always will be home. She got an early start with amateur reporting in high school for the publications department along with working on the newspaper, photography, videography and yearbook. Once it came time for college she started as a Nursing major and quickly realized that her passion lied elsewhere. 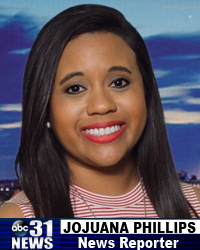 Jojuana graduated from Louisiana State University of Alexandria with a Bachelor’s Degree in Mass Media Communications. During her last semester of college she interned at Cenla Broadcasting and still holds a part-time position with the company as a radio personality for Q-93 while being a full time reporter for KLAX. When she’s not working you can find her playing with her two dogs or catching up on much needed sleep! 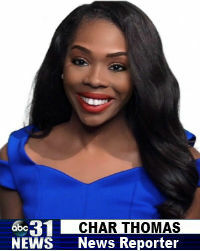 Char Thomas was born in Vallejo, Ca, but Louisiana has been her home for most of her life. Char knew she wanted to work in TV news ever since she realized she could make a huge impact in others’ lives . Her dreams of working in the business were solidified after interning at KSLA NEWS 12 and NBC 6 NEWS in Shreveport, La. Char graduated from Wiley College home of the great debaters in Marshall, Tx with a B.A. in Mass Communications. During college, she filmed local church services and reported campus stories. Char has received varies honors and awards during her college career. When Char isn’t working she enjoys finding new avenues to better herself and of course, shopping. Char believes there is no magic to achievement. It’s really about hard work, choices, and persistence.